Pre-order for early June 2019 publication and shipping. LOW SHIPPING RATES FOR UNITED STATES, CANADA AND UK ORDERS! Classic Monsters of the Movies issue 16 is another beautiful journey through classic horror cinema, taking in beloved favourites and lesser-known gems with a combination of class-leading image reproduction, information and commentary that’s made it a hit around the world. 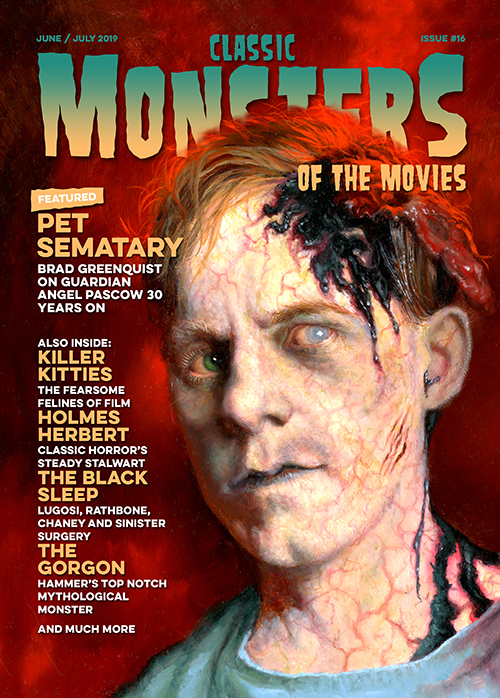 The front cover image is a breathtaking oil painting of Victor Pascow from 1989’s Pet Sematary, and we celebrate the 30th anniversary of the terrifying original movie with a detailed feature on how Stephen King’s novel came to the screen. In a Classic Monsters exclusive, Brad Greenquist shares his memories of playing the grotesque guardian angel, while we explore the movie’s enduring significance in horror culture. Of course, classic horror fans love this movie for another of its stars too, the endearingly enigmatic Fred Gwynne as Jud Crandall – Brad also fondly recounts his experiences of working with this legend. Cat lovers among you will adore the Killer Kitties feature in this issue. Pet Sematary’s creepy Church is just the beginning in a rundown of the freaky felines that have scared us, warned us and sometimes even rescued us throughout the history of horror movies, from Little Maria’s kitten in Frankenstein (1931) to the sinister sentry of Hammer’s The Shadow of the Cat (1961) and beyond. Meanwhile, actor Holmes Herbert is the subject of this issue’s in-depth biography – his extensive body of work took in the likes of Dr Jekyll and Mr Hyde (1931), Mark of the Vampire (1935) and The Ghost of Frankenstein (1942) to name but a few. Medicine takes a turn for the gruesome as we delve into the mystery of The Black Sleep, the star-studded 1956 gothic chiller that always makes for exciting viewing. And more recently, Hammer put a fresh spin on ancient mythology in 1964’s The Gorgon – our discussion of this much-loved niche thriller is packed with information and gorgeous stills that bring this eerie spin on classical folklore to life. Whatever age of horror cinema you love the most, you’ll find it in issue 16 of Classic Monsters of the Movies. Our expert team of writers captures the atmosphere of every movie, while the clean and timeless design lets every crisply reproduced image shine. 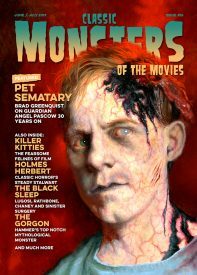 The whole package is produced to the absolute highest standard, making Classic Monsters of the Movies the horror film magazine you’ve been waiting for. Pet Sematary – the 1989 Stephen King adaptation is packed with moments that capture the mood of golden age gothic horror – star Brad Greenquist explores the power of saviour ghost Pascow. Holmes Herbert – this prolific character star appeared in a huge number of horror movies, bringing authority and gravitas to characters across a wealth of classics. Killer Kitties – from big cats to cute kittens, the felines of horror movies usually need more than a saucer of milk to calm them down. The Gorgon – Hammer Horror’s atmospheric chiller took Greek mythology in a whole new direction with sterling performances from Barbara Shelley and Peter Cushing among others. The Black Sleep – Lugosi, Chaney, Carradine, Rathbone – this doom-laden tale of evil surgery always merits another viewing, especially when accompanied by our informative feature. Issue 16 of Classic Monsters of the Movies is full of movie stills and artwork restored and reproduced to the very highest standard. Full colour printing throughout gives imagery a depth and richness that you won’t find elsewhere, while leading-edge journalism brings a new angle on the classic horror movies you love. Classic Monsters of the Movies is the ultimate magazine for any monster kid. Remember, you can save money with a discount on each issue when you purchase an advance subscription to Classic Monsters of the Movies. Click here for details! Want to know more about the magazine? 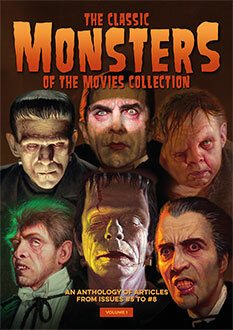 Visit the official Classic Monsters of the Movies magazine website here.